A Port Talbot steelworker has sold the Banksy piece that was unknowingly painted on his garage wall for a six figure sum. 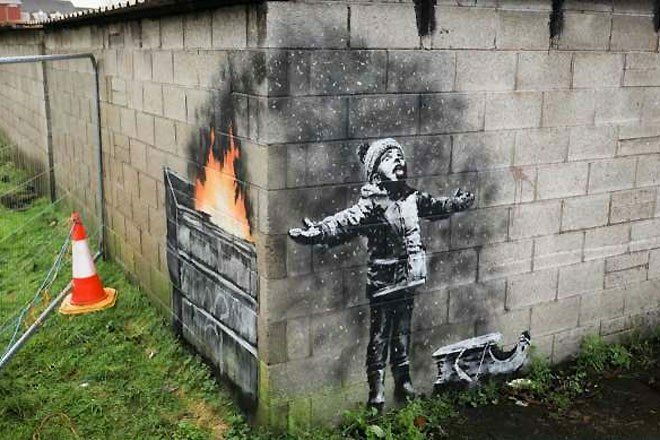 Ian Lewis unexpectedly became the owner of a Banksy piece a week before Christmas but struggled to manage the crowds of people coming to see it, with an estimated 20,000 people visiting since it appeared, even after actor Michael Sheen offered to pay for the security costs. Lewis accepted a six-figure sum from Essex-based Banksy expert John Brandler, who plans to keep the artwork in Port Talbot for at least two years. Lewis plans to spend the money on “a few holidays” and rebuilding his garage once the art is removed. In 2017, Goldie may have accidentally revealed that Banksy’s real identity is Robert Del Naja, of trip-hop legends Massive attack.